Nickolas Berry has a diverse civil litigation practice in which he handles cases emphasizing insurance and business contract disputes and their associated tort claims, and the defense of products liability and serious personal injury matters. Mr. Berry handles employee benefits litigation, both ERISA and non-ERISA, and has represented employee benefit plans in defense of claims for benefits and a plan fiduciary in defense of alleged breaches of ERISA, 29 U.S.C. §§ 1104(a)(1)(A), (B), and §§ 1106(b)(1), (2). Mr. Berry has substantial trial experience and is skilled at case analysis and the development of strategic litigation plans. He works closely with his clients and consults with other team attorneys to avoid litigation when possible and to create a trial-ready posture when necessary. Before joining in Hinshaw & Culbertson LLP in August 1993, Mr. Berry served from 1981 to 1986 under Janet Reno as an Assistant State Attorney with the Dade County State Attorney’s Office. 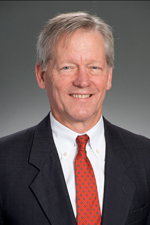 He entered private practice in 1986 at Magill and Lewis, P.A., moving to Kimbrell & Hamann in 1992. Defense of a manufacturer in several thousand asbestos cases in South Florida. Prosecution of an indemnity suit on behalf of an insurer against an insurance broker for allegedly scrubbing adverse risk information out of an application for lawyers' professional liability insurance, which caused a $3 million payout by the client insurer. Defense of an insurer under an all-risks policy against claim for the loss of high-grade shotguns with alleged present value of $6-8 million that "mysteriously disappeared" in a deal between insured and a foreign gun distributor under investigation for running an alleged Ponzi scheme. Until 2010, Nick raced triathlons, including two full "Ironman" distance races, long distance swim races such as Swim Around Key West and running and bike events. He participates in United States Masters swimming on the North Miami swim team. Nick still has the science bug. His favorite magazine since the 1980s is Science News. Active in his parish and in Emmaus.